Planting Dates. Ideally, September 15 has been a good starting point for western NY. This has been traditionally based on the timing of the average first frost that would eliminate any hessian flies. Fly-free dates can vary based of feet above sea level and distance south of Lake Ontario. Starting dates can range as early as September 6th at 1500 ft. in Seneca County to September 17th at 400 ft. in Niagara County. Variety Selection. Cornell should be releasing the yield results of the 2016 red and white winter wheat trials from across the region around September 1st (Monroe and Livingston counties locally). These results can be viewed at our team web site, http://nwnyteam.cce.cornell.edu/, or send me an email and I'll forward a copy to you. 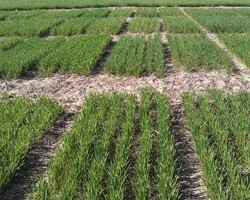 Past years results can be viewed at https://plbrgen.cals.cornell.edu/research-extension/small-grains/cultivar-testing. Seeding Rates. Seeding rates should increase as the season gets later and should also be adjusted based on soil conditions (See chart). Seeds should be drilled 1-1.5 inches deep for good emergence. See examples below on how to calculate million/pounds of seed per acre. To figure out how many pounds per acre, use the following formula. Starter Fertilizer. I still remember Peter Johnson's presentation at Soybean and Small Grains Congress when emphasized that if you are not using a starter fertilizer, then you are leaving 8 bushels on the table. He stressed that phosphorus was most important for wheat. He used the example that while soybeans only need 1 pound of P and corn 5 pounds for strong seedling establishment; wheat needs 15 pounds. Follow your soil sample recommendations and remember wheat grows best at a pH around 6.3. I have seen an increase in the number wheat growers putting down a starter down with great end results! Broadleaf and Grass Weed Management. Winter annual weeds are the most prevalent weed competitor for our winter wheat. Chickweed, purple dead nettle, shepherds purse, corn chamomile and others in the mustard family emerge right along with the wheat crop in the fall and can really pull down yields. Many producers spray with Buctril or Harmony Extra in the fall so they are starting clean in the spring. This is also the best option if you plan to underseed your wheat with clover in the spring. Roughstalk bluegrass and cheat grass can be controlled with Osprey either in the fall or early spring before wheat reaches the jointing stage.